The positive rally in the secondary bond market continued yesterday, as yields were seen decreasing further across the curve on the back persistent buying interest. The liquid maturities of 15.03.24, two 2026’s (01.06.26 & 01.08.26), 15.01.27 and 01.05.29 saw its yields dip to intraday lows of 10.75%, 10.95%, 10.90%, 11.00% and 11.15% respectively against its previous day’s closing levels of 10.85/88, 1095/00, 11.00/10, 11.05/10 and 11.25/28. In addition, on the shorter end of the yield curve, the 01.05.20 and 2021’s (i.e. 01.03.21 & 15.12.21) were seen changing hands within the range of 9.92% to 10.00%, 10.19% to 10.25% respectively, while the 15.03.22 and 2023’s (i.e. 15.03.23, 15.05.23, 15.07.23 and 15.12.23) changed hands at levels of 10.45% to 10.50% and 10.65% to 10.78% respectively as well. 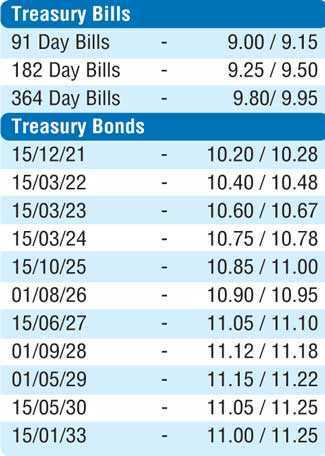 The total secondary market Treasury bond/bill transacted volumes for 10 April was Rs. 18.55 billion. In the money market, the call money and repo rates averaged 8.52% and 8.63% respectively as the OMO Department of the Central Bank was seen injecting liquidity by way of an overnight and five day repo auctions for amounts of Rs. 5.00 billion and Rs. 5.20 billion respectively at a weighted average of 8.54% each. The net liquidity shortfall in the system stood at Rs. 16.09 billion. Meanwhile in Forex markets, the USD/LKR rate on spot contracts remained steady yesterday to close the day at Rs. 174.60/70. The total USD/LKR traded volume for 10 April was $ 126.70 million. 3 months - 177.45/65 and 6 months - 180.30/60.